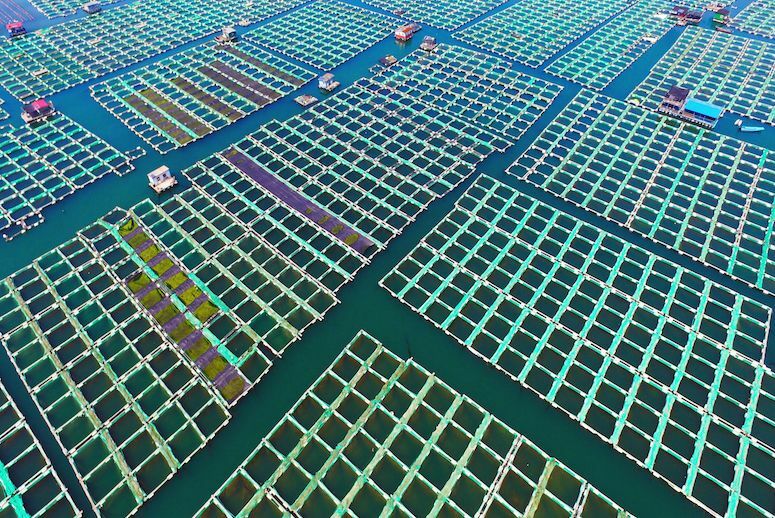 REPORT: NEW TECHNOLOGY CAN MINIMIZE IMPACTS OF INDUSTRIAL FISH FARMS | "Global Possibilities"
Researchers say controversial aquaculture operations like one planned for the Southern California coast could be environmentally sustainable. The United States imports more than 90 percent of its fish, and more than half of that is grown on overseas fish farms. So why not establish aquaculture operations closer to home? “The benefits of creating a robust aquaculture system are significant, and Southern California could serve as a model for the nation,” said Jerry Schubel, president of the Aquarium of the Pacific in Long Beach, California. The aquarium was a partner in a study released Tuesday analyzing the viability of aquaculture operations in federal waters and the potential use of technology to address concerns over the environmental impact of large-scale aquaculture. The U.S. has a $14 billion seafood trade deficit, according to the report. The researchers recommended that the National Oceanic and Atmospheric Administration become the lead agency for permitting aquaculture in federal waters and that funding be increased for scientific studies on fish farming. James Morris, a NOAA marine biologist who is a coauthor of the report, said that researchers analyzed the available scientific literature to assess how fish farming affects water quality, the seafloor, and wildlife such as whales and dolphins. “The main outcome is that the science and tech exists to do it, but the key is to be smart about where and how we do it,” he said. In January, NOAA issued a rule allowing fish farming three miles offshore in federally controlled waters. Morris and his colleagues are creating a complex model of fish farming, one that analyzes how fish would move around in cages and how currents would transport waste from aquaculture operations. The first proposed deep-sea aquaculture project in U.S. federal waters, called Rose Canyon Fisheries, would be 4.5 miles off the coast of San Diego. A partnership between Hubbs–SeaWorld Research Institute and private equity fund Cuna del Mar, Rose Canyon would be the world’s largest fish farm to grow yellowtail jack and possibly white sea bass or striped bass in net pens or cages. The plan is to ramp up production over eight years, starting with 2.2 million pounds of fish per year and gradually increasing to 11 million pounds per year. The project team is in discussions with the U.S. Navy and the U.S. Army Corps of Engineers to site the project to avoid conflicts with whales and ships. Some environmental groups argue that it’s not possible to operate large-scale farms without significant environmental consequences. “There’s no doubt that we need to address overfishing, but factory farms in our oceans aren’t the answer,” said Kristen Monsell, an attorney with the Center for Biological Diversity. For instance, she says, one of the fish Rose Canyon wants to farm is striped bass, which is not native to the Pacific Ocean. If striped bass escape their cages, they could prey on salmon. In addition, fish farms could attract predators, such as sea lions and birds, that can become entangled in lines attached to cages. Paul Olin, aquaculture specialist with the California Sea Grant, another partner in the study, said that new technology such as vaccinations for fish, improved net design and materials, and new sources of protein for fish feed would alleviate many concerns.